Sahi Pro provides support for automation of flex applications via the Sahi Flex Library (SFL). To enable automation, the flex application needs to be compiled with Sahi's swc file. warning After compilation refresh the browser cache, to make sure that the modified app is available. In Flex Builder, select your Flex project in the Navigator. Select Project > Properties. The Properties dialog box appears. Select Flex Compiler in the tree to the left. The Flex Compiler properties panel appears. From the dashboard, open any browser and navigate to your flex application. Press ALT and double click on the document window of the page which you want to record. Sahi's Controller window will popup. You can now start recording your Flex application. warning Ctrl + hover (to get a flex element's accessor) will work only if the Flex application is in focus. To do this, you will have to first click on the Flex application. Sahi identifies flex components based on the type (class name) of element and one of its visible/significant attributes. The attributes may be one of label, text, name, automationName, toolTip, id, autoGeneratedName, index or some other attribute which is relevant to that element. Sahi, by default, adds support for most mx and spark components. CTRL Hover on the element which is a parent of the element you want to recognize. You can use up/down arrows near the Accessor field on the Controller. Once a parent element is identified, click on the "List Properties" button on the Controller. It will list down all components inside the parent and also all attributes. For clickable elements, keep action:"click". For text input elements, use action:"setValue"
Set value to the attribute which conveys the value of that field. For example, a dateField will have selectedDate as its value attribute. This will be visible in the "Value" field on the Controller, and is used in assertions. The name of the API is by default the lowercase of the classname. If apiName attribute is specified, that is used instead. Eg. in the above case, the api becomes _flex("id").myotherclass("id2"). If apiName was omitted, the api would have been _flex("id").myclass("id2"). Sahi's Action APIs also work with Flex elements. SFL supports near, inside, leftOf, rightOf and under APIs. The usage of these APIs is a little different from the Sahi relation APIs. The relation APIs are called as member functions. They can be chained to use multiple relations. For the CTRL-Hover to work, one needs to click on the Flex app and bring it in focus. File upload/download are not currently supported. NumericStepper recording does not work. However it can identified from the Controller and scripted. The flex recorder in Sahi is not as sophisticated as the web recorder. To introspect and identify elements, one can use the Evaluate Expression box. Copy the accessor into Evaluate Expression box and click "Test->"
Explicity put component.listProperties() into Evaluate Expression box and click "Test->"
To fetch the value of an element, use _getValue() API. Depending on the type of element, Sahi will correctly return its "value" attribute. To fetch the text of an element, use _getText() API. On flex it fetches the textual content of the component (behaves like innerText in HTML). 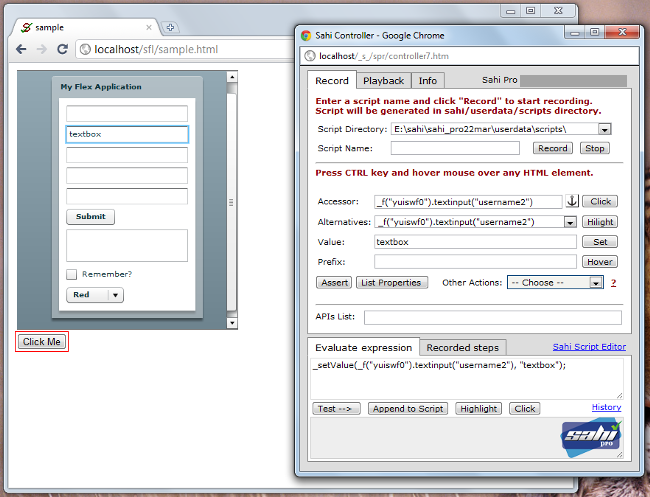 Your Flex app needs to be compiled with the appropriate swc file based on the Flex SDK used. It does not have a dependence on the Sahi Pro version itself. The swc files available for compilation can be found inside the sahi_pro/sfl folder.